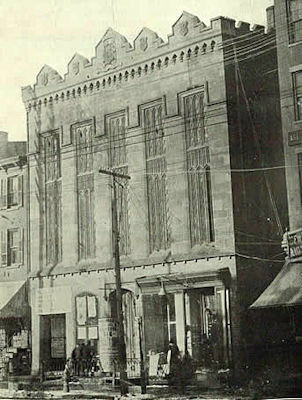 The Newark Library Association was chartered February 9, 1847 at 115/117 Market Street. The middle of June, plans and estimates were advertised for, and the following month those submitted by Mr. J. C. Wells, of NY were adopted. In September the contracts for the erection of the building were entered into with Mr. Isaac P. Brown as mason, and Messrs. Kirk & Kirkpatrick as Carpenters and the work commenced. The main building is 51 feet square, 3 stories high with basements, the entire front is of chiseled stone (from Israel Crane's Quarry), the basement contains two finished apartments extending from front to rear, suitable for stores, and the necessary rooms for fire furnaces, coal, etc. On the first floor are two large and commodious stores with a convenient Hall extending to the rear, affording access to the Lecture Room and to the rooms above; on the second floor is the Library room extending along the entire front 51 by 30 feet, with two rooms adjoining and communicating with it, for reading or conversation. The third floor, are rooms appropriated for the use of the New Jersey Historical society, and a spacious apartment which has bee rented by the city, and fitted up in splendid style with gas fixtures, etc. for the use of Common Council. In the rear is the Lecture room 51 by 65 and 18 feet ceiling sufficiently large to seat comfortably 700 persons, the whole building is lighted with gas and was first opened for the transaction of business on Monday evening February 21, 1848. The whole expense of the building, when completed, is estimated at $12,000, the number of shares subscribed for were 645 by 319 personas at $25 per share.